China Southern has scheduled the return of the Airbus A380 services to Sydney over the coming summer months. According to updated schedules loaded into travel booking systems, the will A380 operate the overnight flight from Guangzhou before turning around for a daytime departure out of Sydney. The superjumbo looks set to take over one of China Southern’s twice daily service from its Guangzhou hub to Sydney during the peak holiday period from December 1 to February 28, 2015. China Southern launched a daily A380 service to Sydney in October 2013, but it was dropped in February 2014 in favour of the smaller Airbus A330. In December 2013, Qantas and China Southern signed a codeshare agreement for flights between Guangzhou and Sydney, Melbourne, Perth and Brisbane, as well as four onward destinations in China. China Southern has also placed its CZ airline code on selected Qantas domestic flights. Meanwhile, China Southern will boost its Guangzhou-Auckland service to double daily over the summer peak season, from 10 per week currently. The extra flights will run from October 26, 2014, to March 29, 2015, using the Boeing 787 Dreamliner. Auckland Airport acting general manager of aeronautical and commercial Charles Spillane said in a statement the extra flights would add about 30,000 seats on the route. 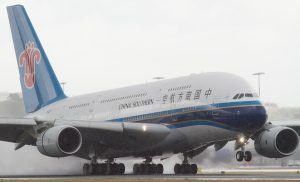 China Southern has stated previously it intended to eventually operate up to 55 services a week to Australia and New Zealand. Between January and February 2014, the carrier flew 48 weekly services to Australia, according to analysis from CAPA Centre for Aviation.